Shor's Stone along the main road. 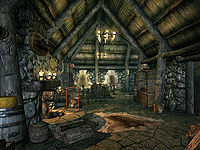 Sylgja's House is a house in the small mining settlement of Shor's Stone. 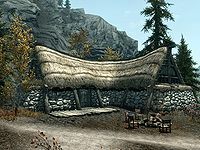 It is located behind the outdoor campfire where the townsfolk gather every night. It is the home of local miner Sylgja who lives there alone. It consists of one area only, Sylgja's House. As is common with houses in smaller settlements, the fireplace and the cooking pot are located opposite to the front door. There are three gold coins sitting on the mantelpiece. The southern part of the house holds little of interest – only two barrels, one of them with a huge goat cheese wheel on top. Next to the fireplace is a dinner table with some food scattered around, two pine thrush eggs, a clove of garlic, three slices of seared slaughterfish, two loaves of bread, a leek and a head of cabbage. Adjacent to the table stands a cupboard with clutter, with a salt pile and a sample of troll fat on top. The northern corner of the house holds a set of shelves with two bottles of alto wine and one of regular wine, as well as a few common books. A chest in the corner holds a sparse amount of items and the dresser underneath holds clothes. Following the wall is an end table that holds clutter and has a steel dagger on top and a food barrel. The corner also contains Sylgja's huge dinner table, which is set up for four although Sylgja always eats alone. It holds three loaves of bread, a sliced goat cheese, two bottles of alto wine and one regular. The double bed stands in the eastern alcove which also has a huge wardrobe with clothes, with a sabre cat pelt on top. There is also a small table with two bottles of nord mead and a chest with valuables at the foot of the bed. Two end tables hold clutter; one has four gold coins sitting on top, while the other has a hat and a potion of haggling on top. On the floor, Sylgja has a pair of shoes and a hidden coin purse.